How to restore the page in the "Classmates"
The users of social network "Schoolmates" often faced with the problem of entering your page, and there are several reasons. It can be locked by an admin due to hacking by unauthorized persons, the presence of spam or virus. There are situations when user has deleted the personal profile, or forgot your username and password. To restore the page in the "Classmates", it is necessary to perform the appropriate actions. in the designated box to describe the problem. After the message is sent within two days by e-mail should come the response of the administrator with further instructions. If violations of the rules of finding the site was a conscious, the administrator will refuse to recover the page in the "Classmates". With the popularity of social networking as a means of communication and interaction with Internet users, and increases the number of scammers who for their own benefits break into accounts and use other websites to send spam. fill out the form (username, e-mail or phone number), enter in the corresponding field the code that appears in the picture and click "continue." to come up with a new password using digits, Latin letters and other symbols, and enter it in the field "new password" and click "confirm". A strong password should contain minimum of eight characters, including a combination of numbers, letters and symbols. When you log on to the page you need to enter the username and new password, and account access will be resumed. 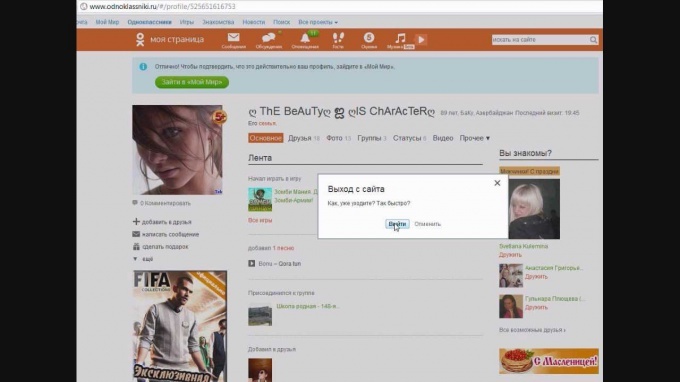 There is another way to restore the page in "Schoolmates" after the break, tested on recognition of pictures of 5 of his friends. This is necessary to ensure that the moderators were able to verify that the account owner tries to change security settings and restore the profile. If the first attempt to recognize photos of friends suggested failed, the second attempt is only possible after a few hours. in the form of address you must fill in required fields with personal data, choose a goal and topic, describe the problem and send a message. Email address should receive a message from the moderators followed by action. Restore the old profile in the "Classmates"
Sometimes the owner of the account on the social network for a long time does not go to your page, and when he decides to visit, you may not always remember the password. In such cases, to restore the page in "Schoolmates" it is possible, using the method of password recovery. For this, you must specify the mobile phone number after receiving the SMS code to enter it into the appropriate field. After this you need to choose and enter a new password, and the access to the page will be opened. If the phone number has changed and does not match the data in the profile, it is necessary to seek the help of support and detail the problem. Restore the deleted page in the "Classmates"
Quite often a user of a social network taken a hasty decision to delete account, but he is trying to restore the page in the "Classmates". Unfortunately, on their own remote page can not be restored, and in the case of a request from a service support refusal. In this case, the only option is to register a new account.